1969 was also the year MBC Aquatic Sciences (as we know it) initiated and completed its very first survey for the Ormond Beach Generating Station in Oxnard, California. 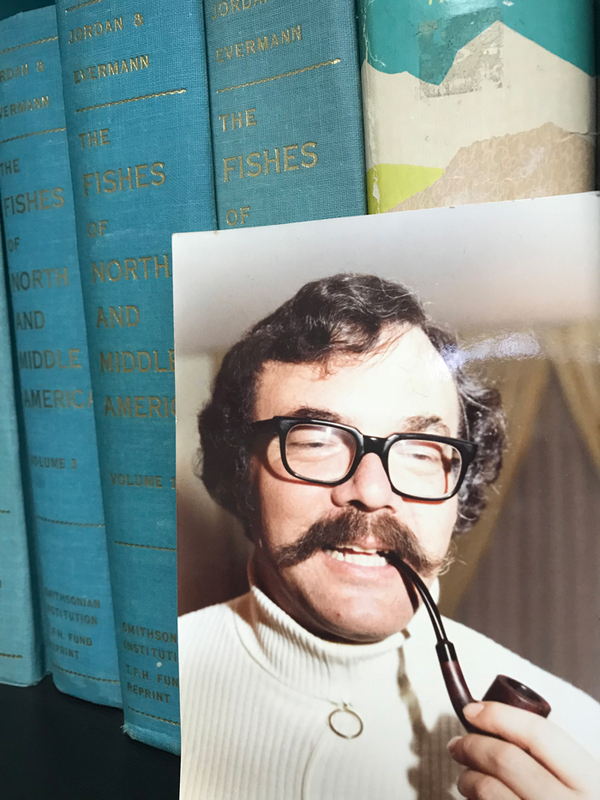 MBC Founder, Chuck Mitchell, didn’t know at the time that he was pioneering new environmental opportunities that would continue to flourish half century later. In the next year, Chuck’s workload as an Independent Consultant had increased to a level that required both additional assistance and an established business structure. 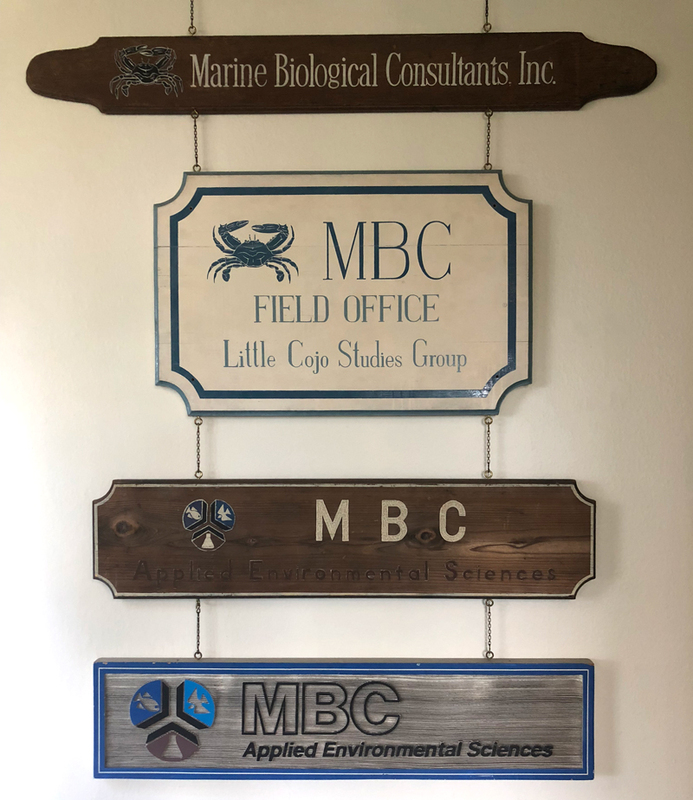 In result, Marine Biological Consultants, Inc. (MBC) was born, with facilities quickly growing from a home office to ever increasing labs and offices in Costa Mesa, California. We could say that MBC was ahead of its time. MBC had the Environmental Protection Agency beat by just one year, as EPA was born in response to environmental pollution concerns in 1970. Meanwhile, the California Coastal Commission was established by voter initiative in 1972 (Proposition 20) and later made permanent by the Legislature through the adoption by the California Coastal Act of 1976. Newspaper articles from the 1970s and 1980s reveal some of MBC’s early work. In the 1970s, ecology and environmental “impact” studies were completely new territories to the public and regulatory agencies. Early participants in this burgeoning industry ranged from aerospace companies to unemployed biology students, and the results were sometimes chaotic. MBC’s early emphasis was on designing and implementing scientifically solid sampling programs. 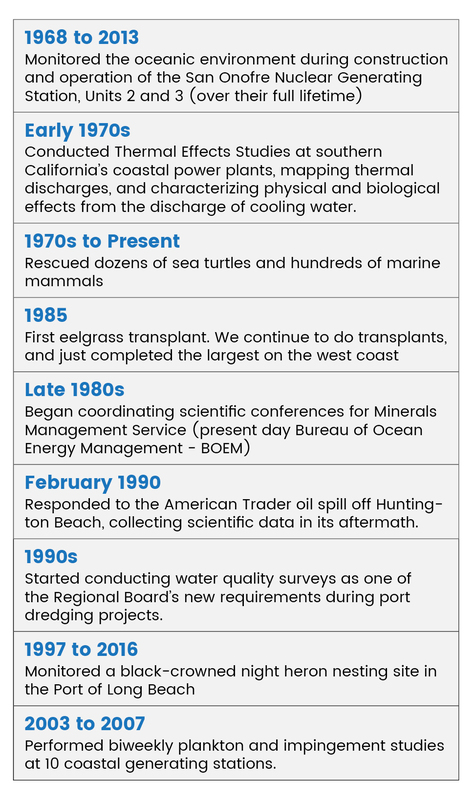 During the mid-1970s, Chuck and other concerned scientists formed the ad hoc “California Committee on Marine Ecological Survey Standards” (occasionally referred to as “Csquare MESS”), to provide regulatory agencies with an essential format for environment evaluations. The curiosity of mankind demands direct observation. Since the beginning, MBC has emphasized direct observation. A terrestrial naturalist has long been able to stroll through the forest and describe the community. The marine counterpart was not able to accomplish this until the mid-1950s with the advent of scuba, and the training of diving scientists at Scripps Institution of Oceanography. In 1955, Chuck Mitchell was one of those trainees that went on to pioneer a company rooted in underwater diving. 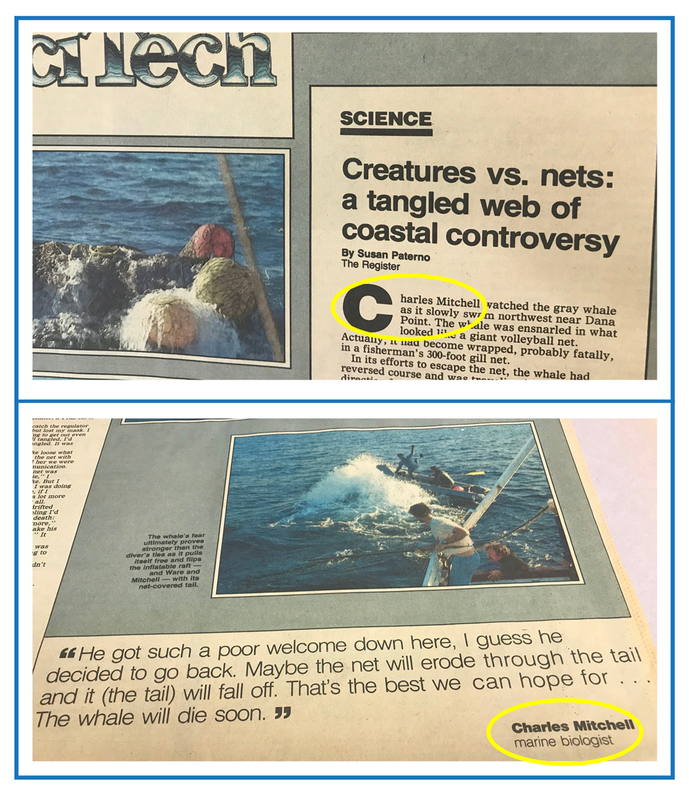 Chuck Mitchell in the "early years"
As the first American Academy of Underwater Sciences (AAUS) Organizational Member, our time within the habitats of those species we aim to protect are some of the most profound experiences, leading to groundbreaking understandings of our oceans. Today, diving scientists at MBC log thousands of hours underwater every year, documenting and restoring the marine environment. ‘Heraclitus, a Greek philosopher born in 544 b.c. said, “No man ever steps in the same river twice, for it's not the same river and he's not the same man.” One of my favorite quotes that accurately describes environmental changes. With the exception of catastrophic events, environmental changes are frequently so minor that they are almost undetectable on an annual basis. It’s a bit like watching a tree grow. Quantitative observations must be made at regular intervals in a repeatable fashion over long periods of time to evaluate the trend. Similar to assembling a digital video…a string of stills that allow you to see movement. Scientific diving has been the heart of our business since the beginning. The first report in our library was centered around pre-discharge biological characterization of the marine environment offshore the Ormond Beach Generating Station (Oxnard, California). The Clean Water Act and other environmental legislation prompted clients to perform monitoring and comply with water quality standards. The company name changed from Marine Biological Consultants to MBC Applied Environmental Sciences in the 1980s as the company started performing more work away from the coast. We formed a toxicity lab, a chemistry lab, and acquired research vessels to venture out into new underwater territories, and meet the needs of our growing clientele. A brief history of some of MBC’s project types reveals ever-evolving service type to meet the need of the present-day environmental concerns. ‍Over the years, more environmental consulting companies have surfaced. However, still very few have the marine capabilities of MBC. MBC is home to a handful of influential employees of whom have been with the company for over 30 years. Their dedication to both the growth and evolution of MBC has helped MBC expand into new waters, as well as made our Costa Mesa base home. Together, we’re a growing tribe of 28. We are serious about our work, but show some practicality along the way. You may see someone in a shirt and tie, and another in a swimsuit and flip flops in the same hallway. On any day, you can find one of our friendly furry dog friends roaming the hallways of our Costa Mesa office, while other creatures of many kinds reside in our historical voucher collections in the taxonomy lab. For 49 years, MBC has deepened its knowledge and expertise in our west coast waters, from San Leandro Bay to Baja California. Today, as we say goodbye to MBC’s very first project location, Ormond Beach Generating Station, we continue to say hello to new horizons for MBC. We’re continuously exploring new territories and services, and expanding as the environment demands. We’re incredibly grateful for each of our employees, partners, clients, and underwater friends that have made this 49-year journey one for the books (and certainly for various reports).